DETAILS: This gorgeous 7 bed, 7 1/2 bath home optimizes space and functionality to create an atmosphere where large groups and families can gather and build beautiful memories at the beach. Located just a 2 minute walk from the Gulf, this home was built for times of togetherness with its open living and dining areas, bright and open floor plan, and clean design that flows effortlessly from room to room. From the entrance, the living room leads into a large dining area and continues on into the kitchen. The bright and airy kitchen offers an island/breakfast bar and a separate sitting area, providing plenty of seating for everyone! Right off the kitchen/dining area is a spacious laundry room complete with washer and dryer, a half bath, and a wet bar with a wine fridge where guests can enjoy their favorite beverages. The downstairs master bedroom and bathroom offers privacy and is separate from the 6 additional bedrooms in the home. Atop the stairs leading to the second floor is the ideal spot for the kids to retreat, play games, or watch movies in the second story living space. An additional master bedroom is found on the second floor with double sink vanities and a spacious walk in closet. Three additional bedrooms are located on this level, complete with en suite bathrooms. Continuing up to the third level is another bedroom and en suite bath along with an additional second master bedroom. Featuring a beautiful wood ceiling, this room simply invites the essence of a cozy retreat. The second story balcony overlooks the private, heated pool, perfect for afternoon swims. Gather your group on the spacious outdoor patios on the front and back of the home, or in the fenced back yard, perfect for bbq'ing and entertaining! Call today to book this incredible retreat with 360 Blue! An absolutely perfect week! We had 8 adults and 10 kids ... the house was PERFECT, absolutely spotless and so much space for pack n plays and each family to have enough room. The walk to the beach was completely ideal with the golf cart to help ease the load. The pool was perfect for the afternoons and evenings with wine. We can't say enough about how awesome our stay was! Thank you!! We are so glad that you had yet another wonderful year with us in Destin! Thank you for choosing 360 blue, we look forward to seeing you again soon! We are beyond thrilled that you all enjoyed your vacation with us in Destin! We especially loved the photos you shared with us, definitely shows how much fun you all had! Thank you for staying with 360 Blue, we hope to see you again soon! One word........EXTRAORDINARY! If you are looking for a great house this one is it. The layout was perfect for us. We had 13 people. Everyone had enough space.We had no issues with the hot water or temperature of the house like I have experienced with other three story rentals. I would highly recommend anyone to book this property. Oh and the sheets were so fresh which was another plus. You can tell cleanliness is a top priority. l will definitely be booking this home again! We are so thrilled that you enjoyed your stay with us in Destin! We agree that this home is an amazing option for larger groups or families looking to have a fun and relaxing vacation! Cleanliness is one of our top priorities and we are so glad to see everything was in perfect condition for you all! We look forward to seeing you all again very soon! We had our family vacation here and we absolutely loved the house. It was spacious, had plenty of rooms, open kitchen concept, etc. The kids loved the pool and the outside shower was definitely helpful. The sheets and towels were very clean and there was plenty of towels in each bedroom. Would definitely stay here again. We are so delighted that you enjoyed your stay with us in Destin! 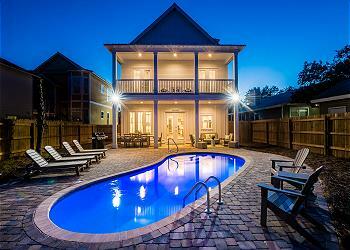 We agree that this home wonderfully accommodates everyone and having the pool at the house is such a great bonus! We look forward to seeing you all again very soon! This was my family\'s first time in Destin and it was absolutely beautiful! Everything we needed was so close and the house was absolutely amazing! My sister and best friend used the concierge services to order birthday surprises for me and said the customer service was awesome! This will become our yearly vacation and a family. Can\'t wait to book for May 2019! We are beyond thrilled that you enjoyed your birthday getaway in this beautiful home. We look forward to seeing you back again soon! We are so thrilled that you had a wonderful vacation with us in Destin! We hope to see you again very soon!! All I can say is wow! We were absolutely stunned the minute we opened the door on how beautiful this home is. Everything is TOP NOTCH. The shiplap walls and ceilings are gorgeous. The heated pool is perfect for days if the weather doesn’t cooperate or you need a break from the beach! Its even lighted with multiple color modes! The kids absolutely loved it! If you’re looking for a house that has everything and more I would highly recommend checking it out. Very spacious and plenty of room for everyone. We walked to the beach and it was easy access - less than a 10 min walk. Can not WAIT to come back again. PS - the Hospitality app is the way to go. It had EVERYTHING we needed to know and share with our other guests (door codes, WiFi, etc). Also it updated ya in events that we would have missed (beach bonfire was awesome and hosted by 360blue). Thank you for the kind words and for choosing 360 Blue for your spring getaway. We loved having you with us and hope to see you back very soon! Yet another wonderful trip to Destin with the family this past February. The weather was so nice, we spent most of the time at the beach or in the pool at the house. My son, Ethan, learned to swim in the pool during our visit! This and so many more memories made this stay another we will remember for a lifetime. Can\'t wait to come back to 93 Stingray. The home was recently named \"The Emerald Pearl\" since our last visit. Very suiting name as the home is truly a beautiful accent to the Emerald Coast. Thanks again to 360 Blue for keeping this home beautiful and welcoming for our visits down from NH. Yet another wonderful trip to Destin with the family this past February. The weather was so nice, we spent most of the time at the beach or in the pool at the house. My son, Ethan, learned to swim in the pool during our visit! This and so many more memories made this stay another we will remember for a lifetime. Can't wait to come back to 93 Stingray. The home was recently named "The Emerald Pearl" since our last visit. Very suiting name as the home is truly a beautiful accent to the Emerald Coast. Thanks again to 360 Blue for keeping this home beautiful and welcoming for our visits down from NH. We are so thrilled that you enjoyed your stay in this amazing home. It truly is a treasure and the perfect place for a beach getaway. We look forward to having you back again soon! We love family vacations in Destin and this one was by far the best! This house was perfect for our extended family to spend Thanksgiving. With a family ranging in age from 8 to 83, we needed a special home to accommodate us well. The 360 Blue team was outstanding at helping us find just that. Anything you could possibly need, this home provided. It was so well appointed, with all the comforts of home plus some. The first floor master was fantastic for Grandma. The ample indoor and outdoor living spaces gave us so much room to relax and have fun. The kids loved the heated pool. The location is so close to the beach, grocery store and restaurants that we ended up biking and walking most of the week. 360 Blue was so quick to help with anything we needed. This was our first trip with them and we won’t book through anyone else again. We filled this beautiful house with a lot of love and laughter and can’t wait to come back! Sounds like everyone had a truly remarkable Thanksgiving getaway. We are so thrilled that you chose to spend your holiday with 360 Blue in this incredible home. We look forward to having you back soon! This house was amazing! They style, the layout the layout! We had a total party of 10, 6 adults and 4 kids and we didn't even utilize half of what the house offered. I was so impressed at the set up of this house and how comfortably so many people could enjoy what it had to offer. We met simply for a get-away and it was awesome. Walking to the beach for the day or a brisk walk at night was such a great amenity. The pool was super convenient for the kids and for the adults as it was heated to a perfect temp! We enjoyed a nice day at Seaside as well and that was the highlight of our stay. We will go back to 93 Stingray as many times as we can! Thank you for the hospitality! We are thrilled that you had such a wonderful stay at this amazing home. It is truly everything you said and more. We look forward to have you back many times in the future! We loved our stay at 93 Stingray Street that we are already planning on next trip! The home is absolutely gorgeous and spacious. The pool was fantastic! The short walk to the beach was a breeze. It was the perfect place to spend my 30th birthday. We will definitely be back! We are thrilled to hear that you enjoyed your stay with us so thoroughly! 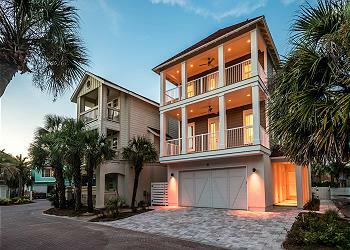 This home really is perfectly located to enjoy our gorgeous white sand beaches! Thank you so much for choosing 360 Blue for your 30th Birthday vacation! We love being part of such wonderful celebrations! We look forward to helping you plan your next vacation with us! Our family had a wonderful time and the house was fabulous!! We loved the pool and the separate living areas. We had three generations and it allowed everyone to have their space. The beds were extremely comfortable and the house was well equipped. I would recommend two face cloths and hand towels for each bathroom. The only thing I missed having in the kitchen was a couple of 9x13" baking dishes. Also, we had to buy a skillet because the ones in the house were impossible to clean. We would rent this house again and highly recommend it for a large group! What a beautiful group photo! It looks like you got to enjoy some perfect beach weather during you stay with us! We are so happy to hear that the property could fit your needs so well. Thank you so much for choosing 360 Blue for your family's beach vacation and for taking a moment to provide your valuable feedback for us. We will be sure to pass your suggestions along! We hope to see you all back at the beach soon! Looks like it was a fun day to spend at the beach! 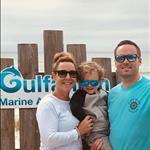 We are so happy you and your family enjoyed your vacation in Destin so much! We do apologize about the beach mishap and we hope that didn't hinder your stay too much. Thank you for staying with 360 Blue and we hope to have you back at the beach again soon! Beautiful home! Highly recommend it to a large group. We were 18 (including kids) and we all had our own room. Just perfect for our Family/Friend vacation. Kids enjoyed the pool and the 3 min walk to the beach. Can't wait to be back in Destin to make more memories. Thank you 360 Blue! What a gorgeous shot of the beach! Those views and water never get old! Thank you so much for staying with 360 Blue! We are beyond thrilled you had enjoyed your vacation so much! Be sure to visit us again soon! We traveled with three families with a grand total of 18 people. This house was perfect for a large group. Lots of bedrooms and bathrooms and the pool was fantastic and used multiple times a day. I highly recommend this property. We are so happy you enjoyed your stay in Destin! Thank you so much for choosing to stay with 360 Blue and be sure to come back and visit us again soon! Our stay here was amazing. This house is beyond perfect. Every detail in this home is beautiful and our family of 12 enjoyed it so much. The pool was a welcome relief from the hot days. Thank you for an amazing vacation! What a great group photo! We love seeing those smiling faces! We're happy to hear that you enjoyed the property so much! Thank you for choosing 360 Blue for your beach getaway. Be sure to come back and visit real soon! We throughly enjoyed our time at this property! We had a little smoke alarm issue but the property management responded promptly and were extremely friendly! The house is gorgeous, spacious, and within a great location! Thank you for opening up your home for our family of 15 and allowing us to make even more memories! What a gorgeous beach photo! We are so happy you had such a wonderful vacation in Destin! We are happy to hear that the smoke alarm didn't hinder your stay and we are glad we were able to fix that for you! Thank you so much for choosing to stay with 360 Blue and be sure to come back and visit us again soon! We had such an amazing visit to Destin. The home was even more beautiful in person than the pictures revealed and we couldn't have been more impressed with the entire 360Blue team. The welcome basket of goodies for the adults AND the kids was a very warm touch. Thanks to everyone there who made our stay so special. What a cute picture! It looks like you guys got to make some fun memories that will last a lifetime! We're so pleased you enjoyed your stay and the home so thoroughly, thank you for choosing us for your family's beach vacation. Come back and visit with us real soon!